Stumped on a Gift? Give the Gift of Your Time. 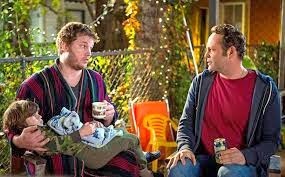 The hubby and I enjoyed a feel good movie on date night this week, Delivery Man with Vince Vaughn. Man, he is tall! If you were wondering, just like me, is he really that big or is everyone else puny? Vince Vaughn is 6’5″. As you can tell, it was lady’s choice. Even though it averaged about 2 stars in the ratings, to all the men out there who might not want to go to this movie, you will leave the theater feeling good. Take your wife, girlfriend, significant other…the night will end good for you ;). There is a part of the movie that really got me thinking this holiday season. There are a lot of people out there who need our help and not just financially. They just need someone by their side. You may know a few. A neighbor, a distant relative, maybe the parent, aunt, uncle, or grandparent of a friend who doesn’t make it home for the holidays anymore. What would it take to ask them to join you for a cup of coffee. Maybe it’s not someone you know, maybe it’s a stranger. My husband and I were in a Starbucks in the heart of the D. At the table beside us was two men. One, was clearly living on the streets. He wore a shoe on one foot and one half of a boot on the other. His companion had clean clothes and cash. They talked like they were old friends. I marveled at the mutual respect the two men shared. Both left the coffeehouse feeling great about themselves. I am not recommending that you go to Detroit and befriend the first person you come across on a corner, but for those who want to make a difference, there are plenty of opportunities to do so. Children’s Hospital Volunteers provide a wonderful gift to patients and their families by offering their time, their presence, their smile, and kind gestures that can draw a smile or even a giggle from the child, making their day as normal and happy as possible. A Time to Help A Time To Help has staged more than 100 monthly projects ranging from building houses, delivering meals, beautifying city streets, running adoption fairs, repairing homeless shelters, packing food, and hosting an annual Christmas party to a shelter for battered women. Volunteer Match Find a cause that lights you up. Get in touch with a nonprofit that needs you. Network for Good Some of the best reasons to give are the ones you may not have considered — the ones that make it worth your while to go that extra step. People who have spent time volunteering for a cause report that they get back in satisfaction and joy more than they ever expend in inconvenience or effort — what you get back is immeasurable.